I remember putting a lot of time and love into Annabelle and Ainsleigh's special personalized soft books when they were young. They treasured them. Rowan somehow missed out on getting one of those, still doesn't have a baby book filled out, nor has a first year photo album like his sister have. It has been a really satisfying feeling putting the finishing touches on his felt quiet book, though, and having him on my lap this past Sunday playing with it for the first time. I wanted to put more emphasis into the details of each page of this felt book and not be constrained to the machine. That is the advantage to working with felt: you can cut felt without needing to finish off edges. I decided to do absolutely no sewing (except the binding) so the entire book would be consistent in terms of tension/stretch on each page of the book. Hot glue is the key for this whole project. For the quiet book, all you need is different colors of felt (I used both craft + wool felt), sharp fabric scissors, metal snaps (for closure) , and hot glue gun + glue stick refills. Tip: To make your felt book project even easier, buy a precut package of craft felt sheets at any fabric or craft store. These felt sheets (usually around 10" x 13" sheets) can be used as your book's pages--no need to cut felt pieces into pages. Tip: Glue down the basic backdrop of your felt play scenes onto your felt sheets. This makes it easy for a child to build onto the scene with the moveable felt pieces and not have to remember what the scene is supposed to be. In the beach scene, I hot glued the ocean, sand, sun, and birds. Rowan simple adds to the scene with extra details in his play. Tip: Play around with your felt pages in terms of vertical and horizontal layout. I liked my face activity vertical so there was room enough for the beard, bow tie, and tall hair. Tip: When making a narrow felt piece, hot glue a felt detail onto the piece to make it more sturdy and less flimsy, like my utensils. Tip: Make your felt pages more realistic by adding depth. You add depth by hot gluing another layer onto the base felt piece, like the outer piece with cut-out squares I added to the dump truck. Tip: Add glitter, ric rac, beads, and other decorations to create a 3D effect. I added hot glue + glitter to some of the ice cream scoops to create the drizzled topping effect on the ice cream. Where do I store all of the felt pieces? 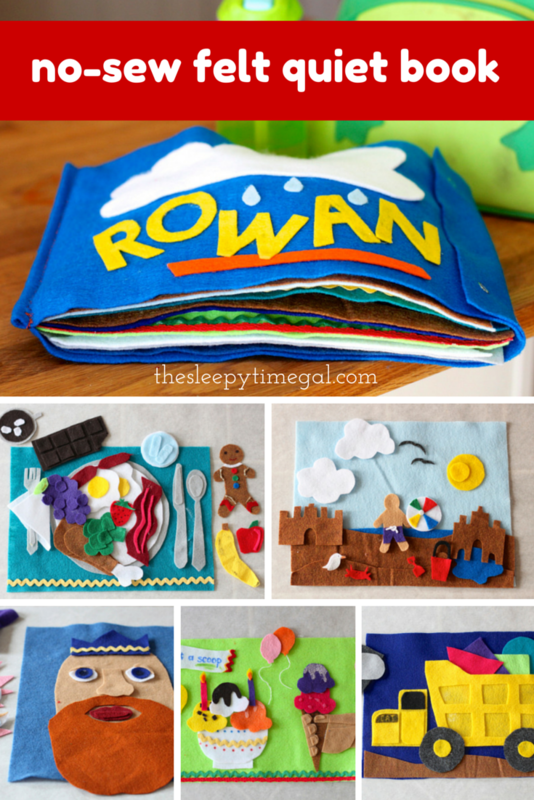 After you've created each felt page and its pieces, cut out large felt pockets, one per activity page. Hot glue the sides and bottom of each pocket onto the back of each activity page (excluding the last activity page--it won't need a pocket on its' back). Fill each pocket with the coordinating pieces for the activity page that the pocket faces. That means the first activity page's felt pieces will be stored in a pocket you secure to the inside of the book's cover. How do I bind + close the book? You have two options for binding your book. I chose the easiest which was using my sewing machine. I know this is a no-sew book but if you can machine sew the binding it will be your quickest, easiest option. Simple sew the pages together with a seam and then sandwich the pages into the cover and sew one more seam. If you don't have a sewing machine, simply hand sew the binding to create a strong binding. I do not recommend using hot glue for the binding. Add a few metal snaps to the cover flap for closing the book. Follow the no-sew snap instructions which will require a hammer. A few snaps will do the trick. I hope you make a no-sew felt quiet book. Make pages based on activities and themes that your child/grandchild loves. Rowan's favorite pages are the dump truck and food pages, of course. Which page was your favorite? ?